Arc flash, a type of electrical explosion, is one of the most complex workplace risks that exist. It is often described using technical terminology and acronyms. Also, several basic concepts and definitions are key to understand­ing how arc flash hazards are measured and how this informa­tion can be used to help protect personnel. Below are the most important ones with simple explanation. 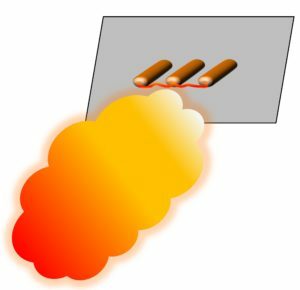 This is the amount of thermal incident energy to which the worker's face and chest could be exposed at working distance during an electrical arc event. Incident energy is measured in joules per centimeter squared (J/cm2) or calories per centimeter squared (cal/cm2). Minimum reported incident energy is 0.25 cal/cm2 which is the accuracy limit of the test equipment. A value in cal/cm^2 to determine arc flash boundary (AFB) distance at that Incident Energy. The Incident Energy of 1.2 cal/cm^2 for bare skin is used in solving equation for arc flash boundary in IEEE 1584 Guide for Performing Arc Flash Hazard Calculations. However, the Guide equation for arc flash boundary can be solved with other incident energy levels as well such as the rating of proposed personal protective equipment (PPE). 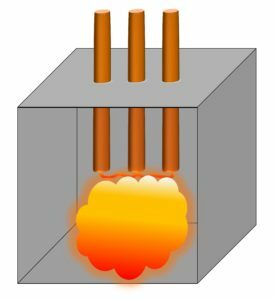 The Incident Energy at Arc Flash Boundary value should be equal or above incident energy to second degree burn for bare skin exposure. 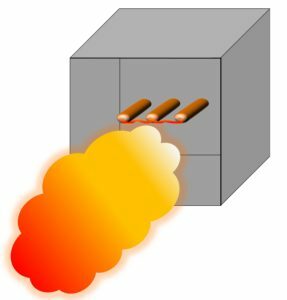 The arc flash boundary is an approach limit at a distance from exposed live parts or enclosed live parts if operation, manipulation, or testing of equipment creates a potential flash hazard, within which a person could receive a second degree burn if an electrical arc flash were to occur. A worker entering the arc flash boundary must be qualified and must be wearing appropriate PPE. The arc flash boundary is required to be calculated by NFPA 70E. This is the minimum level of Personal Protective Equipment in calories per centimeter squared, as evaluated in IEEE Standard 1584, with the intent to protect the worker from the thermal effects of the arc flash at working distance from the source of the arc. 0 Untreated natural fiber long sleeve shirt & pants with a fabric weight of at least 4.5 oz/yd^2, safety glasses, ear canal inserts, heavy duty leather gloves. 1 Arc rated (AR) shirt and AR pants or AR coverall, AR face shield, AR jacket, safety glasses, hard hat, ear canal inserts, heavy duty leather gloves, leather footwear. 2 Arc rated (AR) shirt and AR pants or AR coverall, AR flash suit hood, AR jacket, safety glasses, hard hat, ear canal inserts, heavy duty leather gloves, leather footwear. 3 Arc rated (AR) coverall over AR shirt and AR pants, AR flash suit, AR hood, safety glasses, hard hat, ear canal inserts, AR gloves, leather footwear. 4 Multilayer arc rated (AR) flash suit over AR coverall over AR shirt and AR pants, AR flash suit hood, safety glasses, hard hat, ear canal inserts, AR gloves, leather work shoes. 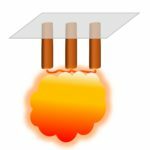 Research has shown that incident energy can be influenced by the electrode orientation. As a result, the IEEE 1584 - 2018 project team conducted many tests using electrode orientations that include both a horizontal configuration and vertical electrodes that terminate into an insulating barrier. When the electrodes are placed horizontally, the arc plasma is directed from the ends of the electrodes outward. 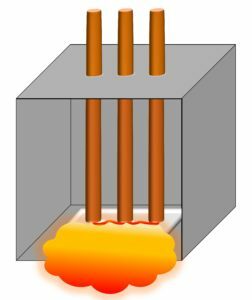 Research has also indicated that if vertical electrodes are terminated into an insulating the arc hits the barrier and the plasma cloud is directed more towards the enclosure opening. Tests were also conducted in open air and included the original vertical configuration in open air and a new configuration with the electrodes oriented horizontally. Gaps of 6 to 76 mm. (0.25 to 3 inches) were used for low voltage 208V to 600V testing to simulate gaps between conductors in low voltage equipment and cables. Gaps of 19 to 254 mm. (0.75 to 10 inches) were used in 601V to 15,000V equipment testings. The enclosure size can have a significant impact on the arc flash energy being expelled and reaching a worker. To address this, additional enclosure sizes were included in the IEEE 1584 - 2018 test program. An enclosure size correction factor has also been introduced to adjust the incident energy for smaller and larger enclosures. For equipment operating at voltages less than 1000 volts, the next edition now makes a distinction between "Shallow" enclosures which are less than eight (8) inches in depth and "Typical" enclosures that are greater than 8 inches in depth. Minimum Width: The width of the enclosure should be larger than four times the gap between conductors (electrodes). Typical working distance is the sum of the distance between the worker standing in front of the equipment, and from the front of the equipment to the potential arc source inside the equipment. Use protective device characteristics, which can be found in manufacturer's data. For fuses, the manufacturer's time-current curves may include both melting and clearing time. If so, use the clearing time. If the curve only consists of the average melt time, ten percent of time plus an additional 0.004 s should be added, to determine the total clearing time. If the total clearing time at the arcing fault current is less than 0.01 s, then 0.01 s may be used for the time. For low-voltage circuit breakers with integral trip units, the manufacturer's time-current curves include both the device tripping time and clearing time in most cases. Note that some low-voltage power circuit breakers may be equipped with retrofit trip units. The time-current curves included with the replacement trip unit may, or may not, include the circuit breaker operating time. If the curves show only the trip unit's operating time, a circuit breaker operating time (typically 0.05 s or three cycles) should be added. For relay operated circuit breakers, the relay curves show only the relay operating time in the time-delay region. For relays operating in their instantaneous region, allow 16 milliseconds on 60 Hz systems for operation. The circuit breaker opening time must be added. Opening times for particular circuit breakers can be verifed by consulting the manufacturer's literature. Available 3 phase short circuit current for the range of 500A to 106kA (208V - 600V) or 200A to 65kA (601V - 15kV) at the point where work is to be performed. If you've never done short circuit analysis in the power system you are working with, please consider using ARCAD's Short Circuit Analytic (SCA) software program to determine the available fault currents in the system. System line-to-line voltage for the range of 208 to 15,000 Volt (VCB, VCBB, HCB and HOA electrode configurations). For cases where voltage is over 15kV, the theoretically derived Lee method can be applied and it is now included in ARCAD's arc flash assessment software. For protective devices operating in the steep portion of their time-current curves, a small change in current causes a big change in operating time. Incident energy is linear with time, so arc current variation may have a big effect on incident energy. The first addendum for the 2002 edition of IEEE 1584 was published in 2004. This addendum added an 85% factor for reducing the calculated arcing short circuit current for systems up to 1kV. The reduction was to account for variations that may occur in the actual arcing current which could affect how fast a protective device may operate. If the reduced arcing current resulted in a longer clearing time and larger incident energy, results based on the adjusted current would be used. Instead of a fixed 85% factor, the IEEE 1584-2018 2nd edition includes an Arcing Current Variation Correction Factor based on using a new equation. This represents a more accurate arcing current variation based on the electrode configuration as well as other factors and applies for all voltages. ARCAD's arc flash assessment software makes possible both calculations for each case considered. It requires that an operating time be determined for both the expected arc current and the reduced arc current. Incident energy is calculated for both sets of arc currents and operating times and the larger incident energy is taken as the model result. This solution was developed by comparing the results of arc current calculations using the best available arc current equation with actual measured arc current in the test database. The 2002 edition of IEEE 1584 made a distinction in the results based on whether a power system is grounded or ungrounded/impedance grounded. During the arc initiation stage when the fuse wire is melting, the arc can be very erratic i.e. unbalanced. The erratic arcing created a difference in the arcing current and incident energy during this very brief period that could be influenced by how the system is grounded. The new IEEE 1584 - 2018 model is based on the more stable arc so there is no difference in the calculations based on grounding.